My alternate name for Cloud Atlas is “six stories in search of a novel”. It’s a series of six novelettes, each one nested inside the previous one. The six are ordered chronologically from the 19th century to the future, but each one is interrupted in the middle so the next one can begin. Moreover, the previous one appears in some form (usually as a book or film) which the characters in the next one encounter. Once the sixth story runs to completion, the stories unwind with each previous one being resumed and running to its end. As a structure wonk, this intrigued me: What sort of larger story is Mitchell telling here? How can he wrap everything up when the end of the book is chronologically the earliest story? And the answer is: There is no larger story, and each story is effectively discrete from the others. The structure is merely a gimmick, and the book would have been perhaps only marginally less effective had the six stories been told in their entirety in sequence (mainly because the cliffhangers in several stories make you look forward to getting back to it). 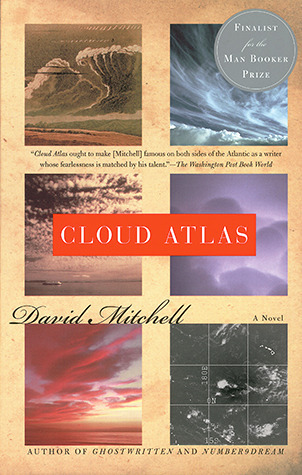 Not that the stories in Cloud Atlas themselves are without interest, but some reviewers’ claims I’ve read that Mitchell is writing each story in a different style are, to my mind, overblown. With perhaps the exception of the last story, which takes place in the far future, all of the stories seem clearly written by the same person, with very minor – if any – stylistic differences. It’s nothing like Dan Simmons’ Hyperion when it comes to showing off writing chops. Considering the six stories on their own, the last one, “Sloosh’a Crossin’ an’ Ev’rythin’ after” is the best one, occurring in a post-apocalyptic Hawaii where humans are trying to survive, and a ship with advantage technology comes by every so often. I’m a sucker for these settings, and Mitchell portrays this one very well, without even making the affected English of the characters annoying. And the ending is satisfying, too. The earliest stories – about an American notary touring the South Pacific and a disowned would-be composer in 1930s Europe – are the least satisfying (which makes the novel’s ending even more frustrating). The other three stories are all enjoyable enough, but nothing special, I felt. For the most part I found them enjoyable stories but not particularly notable, so I have little to say about them. I’ve read reviews about thematic connections among the stories, but I think those connections are pretty weak, and at best fairly obvious observations about common characteristics of human nature. And the book makes so much out of its structure that it suffers a serious blow in that it doesn’t really do anything substantive with that structure. All things considered, I’m not sorry I read it, but I can’t really recommend it, especially to anyone interested in it from a science fiction perspective. There’s probably a great novel to be made out of this structure and approach, but this isn’t it.